NETFLIX ROMAN EMPIRE 2: MASTER OF ROME was released on 27 July 2018. You can view it on Netflix here. 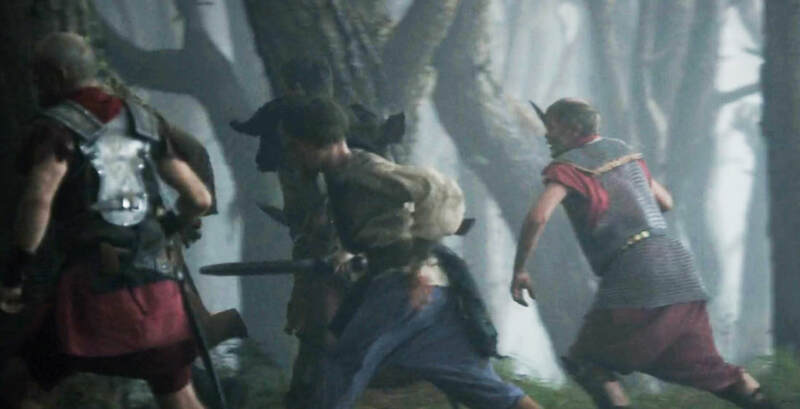 ​It was filmed in New Zealand using props, weapons, and members of our group fighting as Romans including Darren White, Vic Rosendale, Daniel Balderrama, Daniel Dale, Clinton Smith, Darren Green, Andrew Wilson, Bradley Stevens, David Layzell, and Brent Ruijne. Both Darren White and Brent Ruijne were credited as Main Cast with speaking parts. This production was bigger than REIGN OF BLOOD being 9 episodes overall compared to 6, and with an additional budget to film a week of fight scenes. Most of our group wore their own real Roman armor and helmets for the background fight scenes. I think MASTER OF ROME is better than REIGN OF BLOOD for its much smoother pace, editing and narrative. Hoping that series 3 will be even bigger. What did we learn? Your footwear will get wrecked when filming the crossing of the Rubicon River, so don't wear your own caligae, wear the wardrobe dept sandals so they have to clean them! Darren White as Pompey's Scout delivers the message that Caesar's army is approaching. Pompey has been using Lisa's Roman chess set by moving various pieces to indicate the positions of his and enemy forces while planning his battle strategy with his generals on the map. The knight was used to indicate cavalry, which Pompey hopes to use to smash Caesar's flanks. However Caesar had anticipated this move, and countered with a special cohort trained to thrust javelins into the cavalrymen's faces which caused them to break and flee, thus losing the battle for Pompey at Pharsalus. 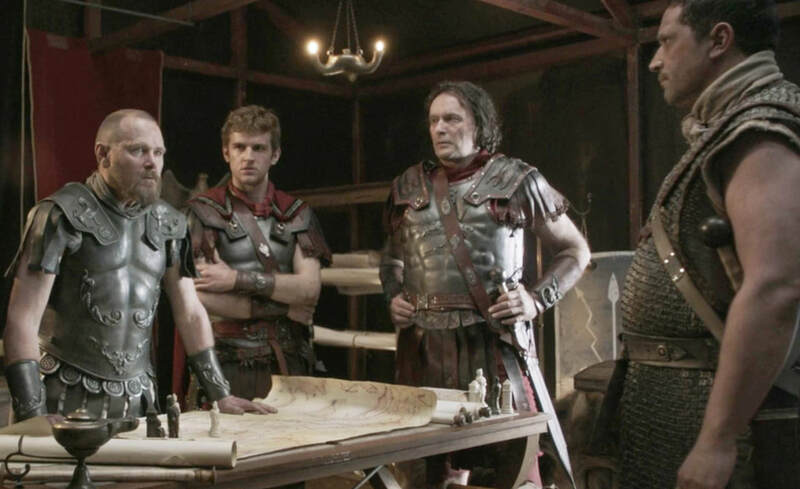 Clinton Smith standing behind Crassus and wearing his own real Roman helmet. The director told him to cover his lorica segmentata because it was "too shiny". In the real Roman army you get beaten by the centurion if your armor is NOT too shiny. Forest scene where Vercingetorix ambushes Caesar's forces. 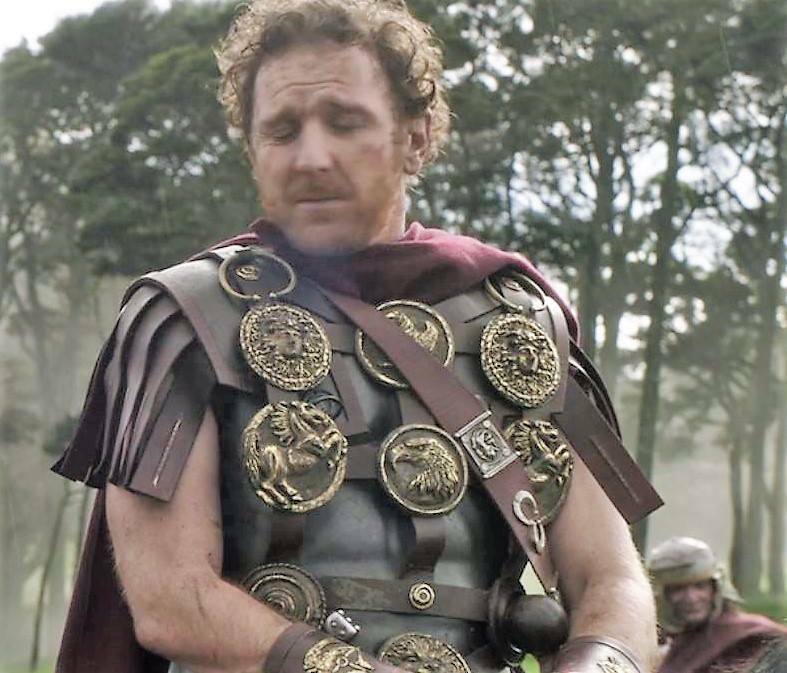 Andrew Wilson shown here wearing his own real Roman chain mail to give the scene authenticity. Most of the prop armor is stylized as shown in the foreground, and used because of budget limitations, it is lighter for actors unused to heavy metal armor to wear all day filming, and gives a "look" similar to the prior Hollywood films that have conditioned the audience expectations of what a Roman is supposed to look like. Whenever a historical film is made, the critics (rightly) question the historical accuracy. In Roman films there will be complaints about main characters not looking like their statues, inaccurate and fanciful costumes (including the wearing of bracers), etc. The problem of these productions is that they are made by a "committee" comprising the financier, director, editor, costuming, and many others. Often the budget hamstrings production so that only what is affordable can be filmed. There may be only certain actors available for various parts. There will always be a place for real human actors, but increasingly CGI in movies is becoming better and cheaper. There is free movie-making software such as Plotagon, as shown below, that anyone can use. This is made using set backgrounds, alterable characters, and varied actions according to your directions. Once rendering improvements and costs decrease it will be possible to use a historically accurate 3D reconstruction of ancient Rome as your set, scan in your characters such as Caesar based on his statue busts, and direct a historically accurate script. Fantastic!